So, camera in tow, I braved the elements to take a few pictures. One of them showed up over here, then it showed up over here, and the people seem to like it. A certain Mr. Storey has made the suggestion that I turn this photo into a Christmas card. Given the relative popularity, it’s not a bad idea, I could get a few sets of a dozen done up and offer them for sale around these parts. Might be worth a shot… I’m just afraid it’s too late for this year. Printing and shipping mean probably a week or so before I’d have something in my hands, and if I decided to sell them, add an extra week of shipping out from here. That takes us to mid-December, and that’s probably just way too late for Christmas cards. So I’ll pose the question to all of you — should I bother this year? I’m wondering who would be interested in a set of 12 cards with that photo (no text, blank interior, thick glossy stock), and if the timing is a problem. Perhaps it’s possible that people would just order them anyway and use them next year if it came to that, but that’s what I need you to tell me. And if anyone has any suggestions for printers that could turn this around in a hurry, I’m all ears. Dave, have you thought about CafePress? Sales could start up now, printing on demand, and all you have to do is upload the pics and advertise. I have thought about using it this season for some shirt designs. Why not wait until next year and then not only sell one set, but multiple sets with different photos? Then you have all of December and winter to build up a nice set of photos to use. This one should certainly be one of them. Awesome shot. Why not? If anything, it’d be a great learning experience for next time you want something printed. I don’t think people will order them and keep them for next year (if they do then they’re just being nice to you). But if you can get them out quick, I’m sure someone would be interested. It’s a nice shot. A little dreary but appropriate for the holiday season. Could use some sharpening done on the foreground (unsharp filter in Photoshop should do it). Not a bad idea, if I see any more snow. It’s not exactly consistent around these parts; this was pretty much a freak storm (and already melting away). Dave, the photo’s great! Do make cards for this year without delay! I’d buy some of those for sure.Even if they didn’t come in time this year, that’s one great photo. I’ll second the suggestion of CafePress. I made my own Christmas cards that way both last year & this year. Pretty fast shipping and good quality. While CafePress might be the quick easy way of getting them out there, the catch is that the base price for 6 cards is $10.99, with no secondary option for 12. That strikes me as a little steep, considering I really can’t check the quality myself. Hmm. This might have to wait till next year when I’ll have the time to do it right. I say go for it with the cards but there’s a better alternative to CafePress. Try out Zazzle (http://www.zazzle.com). It’s completely free to sign up and post as much as you want. The quality is fantastic and you can allow others to personalize their cards if you offer greeting cards. I’ve been using them for years and their quality is top-notch. Plus, they ship very quickly at no extra charge. Dave, just get one of the good digital printers here in Vancouver to print them. Should only take a couple of days if you send them well-prepared PDF files. I use Maranda Digital for lots of basic stuff, but if you want litho quality on a digital press, check out JYT.net. Costs more, but the quality is insane. Good luck, and nice photo. Dave, those are some really beautiful shots. Don’t muck them up by trying to get the speedy turnaround. Take the time to do it right. Find a quality, professional printer, and find some really nice stock that you can appreciate by holding in your hands. As far as timing this with snow…if it’s as rare there as it is down here in Houston, well, those kind of once in a blue moon events get even more cherished as time goes by and memories take hold. I would definitely order a set, probably two if you were to do it this year. I will keep checking back, excellent idea. I’m in Victoria, and have been feeling the recent weather also. The view was pretty good from my apartment, with Beacon Hill Park across the road. I braved the weather and took my camera into the park and got some good photos - I really must upload some! As for the cards, not a bad idea. Wish I’d thought of it sooner. I imagine I know some people who would want some if they were available. It does seem a bit late to be getting them out for this Christmas, but I know some people like getting next year’s stuff early if there’s a good opportunity. I would get some, this or next year. Beautiful! Neener, neeener, East coast rocks! That is a great shot! I love the urban Christmas feeling it has. I’m not usually a greeting card kind of guy but if you have these available for next year I would grab a set. Yaay, no duty. Hello! Those photos are beautiful!! I particulary like the handrail photo and the berrys as well as the pink rose … and the one of the trees (sorry I didnt check photo titles). I havent got any advice for you but to say that they are really pretty and if you sell them on your site I will order some! 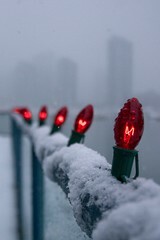 Love the pictures, all I can think of now is snow and that it’s not that long until the holidays. Whatever happened to this (http://www.mezzoblue.com/downloads/pc1024x768.jpg) ? That was real pretty. One of the nicest backgrounds to ever adorn my desktop. Love the photo, but i would also be inclined to wait to make sure the quality was what you wanted. If you don’t have enough photos of your own by next year to make a boxed set of 6 different photos, maybe get with some other people for photo contributions? It might be a hassle, but with the right group, it could be worth the time. Dave, it is really excellent. Dave, you could always print the cards for yourself this year. I know a few people who make their own each year. And I always look forward to receiving them. And I think turning your winter desktop into a card would be a great idea too. You could do an entire series using vector art and not have to worry about the weather playing nice. I just had a bunch of cards done by a local print shop. All I needed to provide was a set of photo prints, which would be used for the front of the cards, and choose card size, stock, and the like. When I included the envelope for each card, the cost per card was just under one dollar! I’ll have to keep an eye out for more picture-worthy scenes (snow, hopefully) the next month or so. If I can get a good set of 10 or 12 unique photos, I might be able to sell some sets of cards for next Christmas, and make a bit of profit off that. Make my camera pay for itself! You are reading “Season's Greetings”, an entry posted on 30 November, 2006, to the Ladybug collection. See other posts in this collection.